Decked out in Sedona red, crowds are gathering at Chase Field, home of the Arizona Diamondbacks, for Opening Day. Soon I’ll enter the gate with my family and friends, my eyes will mist, and I will likely cry. OK, I’ll definitely cry and not because of last year and the obvious uphill battle my home team faces this season. I love a good struggle and learned about the ups and downs of sports as a kid growing up in football country. Later I added other sports to my follow list to include Olympic sports, basketball, and tennis, the sport my husband played in college. But baseball? Not on my radar. My son, Aiden, brought baseball into my life when he was a very little kid. 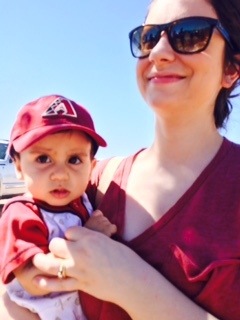 When our family moved to Arizona, we chose the Diamondbacks to be our team because we had no previous loyalties and its root, root, root, for the home team. We love our team like we love our family, through ups and downs. Loyalty is bittersweet. I’m misty-eyed because of the up and down memories of eleven Opening Days. We always bring friends, sometimes very large groups, to include those who don’t know baseball. Yet. We want everyone we love to love baseball, too. As with anything we love, there are bumpy times. I recall the year that my soon-to-be son-in-law and I locked horns for the first time. We laugh about that now. And the year my boys brought girls instead of their teammates. Something about being “just friends.” I’m still not laughing about that. The cliché is true; our children grow up fast. Opening Day has become a gauge of our family’s growth. We’ve come a long way from sitting in the nosebleed seats when my young daughter and I struggled to figure out who “that guy they keep showing on the screen” was. He was some guy named Albert Pujols. Now my daughter is grown, married, and a mother herself living in Washington State. She is allowed to follow the Mariners, but not to cheer for them more than for the D-backs. And this year, for the first time, Aiden will not attend with us. I will miss him deeply and with enormous gratitude and pride. 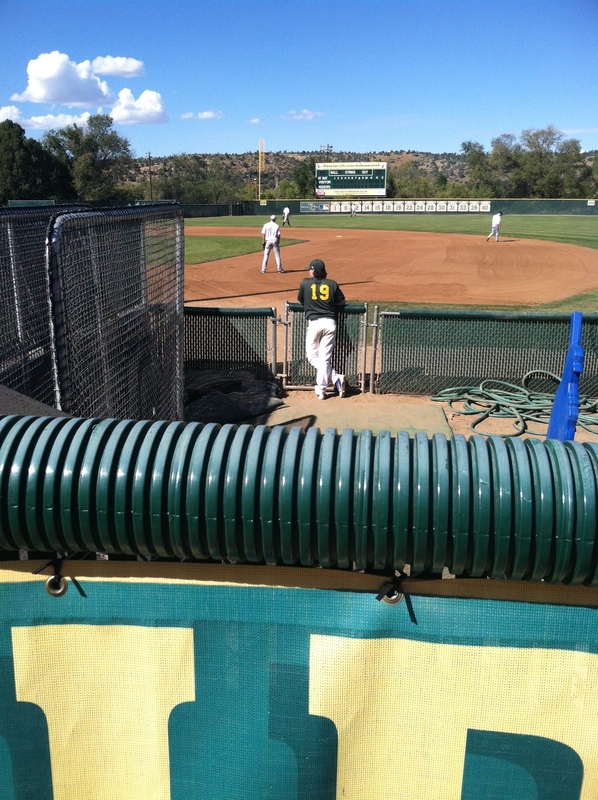 Instead of sharing a Churro Dog with me, my son, the one who started it all, will be playing college baseball. Do you follow baseball? If so, what is your favorite team? If not, what are your favorite sports or activities that you will enjoy this spring? This entry was posted in Character, Family, Friends, Grow, Lifestyle, Relationships, Sports and tagged Arizona, Baseball, Phoenix. Bookmark the permalink. The Blue Jays all the way! My wife and I love that team even though they break our hearts every year. We won our home opener against the Yankees today. WooHoo! A lovely post by the way. Hey, John, I saw the end of your opener just in time to catch Didi Gregorious slide into an out to pretty much kill any chances for the Yankees to come back. I like Didi (former D-back) but duh. Jose Bautista is one of my *fave* players, in part because, yes, he followed me on Twitter when most players were too cool too. RA Dickey, heck yes! I *love* crafty pitching. WooHoo with you! As long as your Jays beat the Yankees and not the D-backs 😀 And glad to hear that your wife is a baseball fan too! And she says Bautista is her baseball boyfriend. I’m much prettier than him so I am not jealous. Sigh. It’s not easy being me. My husband knows your pain. Is this the year the Cubs take it all, Sylvester? 😀 I honestly do hope that I see that glorious day! I know the Coyotes are out I’ll likely catch some of the NHL playoffs because my men will jump in. Oh, and that would be a glorious day 😀 Go Cubs! I’m a huge baseball fan. I still follow the White Sox from my old hometown, and the Braves from my current one. When I traveled, I got a chance to see the Reds in Riverfront Stadium, the Pirates in Three Rivers Stadium, and the Dodgers in Dodger Stadium, as well as the Durham Bulls when they were still a Class A team for the Braves, the Greenville Braves, and the Iowa Cubs. I blew a few other chances to see minor and major league games. But yeah, I love baseball. It’s the only sport I actually understand. Glad to see you again, John, and I’m so happy to connect with another fan! Oh, my, what wonderful experiences you have had 😀 I’ve had the privilege of attending a bunch of spring training locally, have been to 2 All Star Games, and Padres & Angels fields. My men have been to more, including Giants, Red Sox, Cardinals, old Yankees, and a few I’m forgetting. We talk about doing a huge family trip to all MLB cities. Wouldn’t that be the best?! I’ve wanted to do that since reading “Dodger Dogs to Fenway Franks” (which reminds me, I’ve also been to Fenway, Wrigley Field, old Comiskey Park, and new Comiskey Park, now called US Cellular Field, and Atlanta-Fulton County Stadium). It’s a good book; the author and a friend of his took a trip where they went to all the ballparks that were in existence in 1985. I’ve had to give up that idea, though, because of my stroke. Thanks for the book recommendation and I’m so happy for all that you have done. My heart breaks a little for the baseball dreams that you, and I, won’t live. Baseball, the sport that breaks your heart, too. Great post Angie! I’m loving my Chi-town fans here! Although I’ve read little South side vs. North side banter….although that could get ugly..you know us Chicago people, it’s all fun and games until someone dogs on your stompin’ grounds. Cubbies and Sox have my ❤ forever and always, and well with living in Arizona 15 years now, the Dbacks have grown on me too. Another baseball fan! Angie, I’m a Red Sox fan living in New York state, which is always interesting given the number of Yankee fans around here. I brainwashed my 3 boys into being Sox fans as well — the 2004 ALCS didn’t hurt, either. My middle son lives in Seattle and sees the Mariners when he can, but he’s still a Sox fan! Good luck to the D-backs and to your son as well! A mouse named Big Papi? That’s awesome! Pets are one teachable moment after another, aren’t they? As for Bryce Harper, the Nats are MY National League team. My oldest son lived in DC for 3 years and we’d go to a game every time I visited. I miss it! The Nats’ AAA farm team is in Syracuse, where I live, so there’s that connection as well. Harper is a freak of nature! Marathon season. We need to pace ourselves! And stay hopeful…as with life 😀 Happy Wednesday, Jim! Great post, Angie! I love the notion of embracing a team as a family. Oh, football, by the way, lol. Seriously, I have an autographed ball by Bob Melvin 😀 Come on in, the baseball water is fine!